Shanghai is Chinas most comprehensive industrial and commercial city, ranking the first in population and population density. As a tourist city, it attracts travelers from both home and abroad by its commercial activity rather than scenic beauty. Weather during November to April is the coldest and temperatures range between 3.5oC to 13.7oC (38.3oF to 56.7oF). Weather in May, June, September and October is cooling, ranging between 18.6oC to 23.5oC (65.5oF to 74.3oF). Climate in July and August starts to turn warm and temperature can go up to 28oC (82.4oF). Dressing in Shanghai is casual but modest. Bring along some heavy clothing for the winter whereas light clothing is adequate during summer. The currency in China is Renminbi. Credit cards and US dollars are widely accepted in hotels and major shops. Visitors to China must fill out a customs form upon arrival. When you enter the country you are asked to declare electrical goods and luxury items such as cameras, computer equipment etc. Keep this form until you exit to avoid paying duty on goods you brought into the country. There are no restrictions on the amount of foreign currency you can bring into the country. However, one must declare any cash exceeding US$5,000 or the equivalent. Visitors to China are required to fill in a health declaration form at the Customs. Medical facilities are generally adequate in Shanghai. It is advisable to drink only boiled and bottled water. 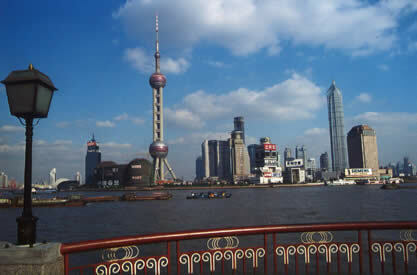 Shanghai is situated on the bank of the Yangtze River Delta, with East River in the east and Hangzhou delta in the south. Housing a population of over 16 million at present, it was once a small town supported by fishing and weaving before the first Opium War. Late in 1990, the central government started developing the area, and has since became the well-known booming metropolis city. Network accepted in Shanghai is GSM. In China, telephoning is relatively easy if you adhere to certain procedures. The best way to place a phone call is to go to the local post office. At most places it is possible to dial directly, in other places you have to ask the operator. There are now public phone booths where you can make calls with a phonecard. Banks and Government offices are open from 9.00 a.m. to 6.00 p.m. from Mondays to Fridays only. It is not a custom to tip and not necessary to do so. Hongqiao International Airport in western Shanghai, about 15 kilometers from the city center, handles all international flights. By taxi, the trip from the airport will take you about 30 min. to an hour. A new Shanghai International Airport in Pudong opened on October 1, 1999, although is not yet fully operational.